If it's August, it must be rabbits. 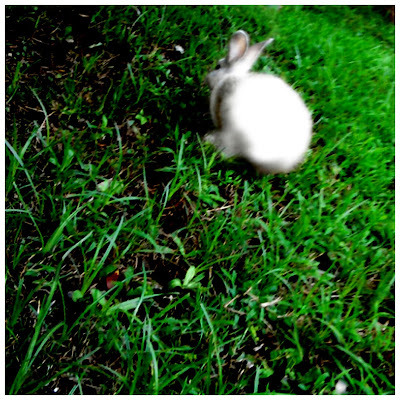 This white one Wednesday evening, 2 of them late yesterday afternoon - brown & black, 4 or so blocks from my house, sitting at the curb, eating grass, no doubt someone's lost pets, or descendants of someone's pets, but nonetheless, rabbits. I stopped the car for this one, phone camera in hand, and off he hopped into a yard, me behind him, feeling more than a little like Alice, wishing he would stop - let me get closer, but he would only tease and hop farther into the yard as I approached, eating his way through the lawn. He eventually stopped in the rear side yard, next to the trash cans, close to the back French doors, so I snapped one close-up and headed back to the street, afraid to be mistaken for a prowler. I like this image of the chase best. moving through this land called my neighborhood, for it is daily full of wonders wild and new - though the rabbits may not be wild, they are certainly new, and if left to their own nature & wanderings, it is only a matter of time before they work their way closer, before there are more of them. I watched an opossum waddle past the door the other night, crossing the yard and then the street, down into the creek next to Mary's house, and such a waddle it was that I laughed aloud. I watched a giant limb fall from a tree next to Mary's driveway - a first time for me, a wonder wild and new; usually I hear the thud first - thankfully no one was hurt, no cars injured (by a miracle of inches), so I could appreciate the wonder of that fall, happy I saw it, awed by its power & speed, by the sound of branches breaking under its weight as it tumbled to Earth, humbled by the powerlessness of us mere mortals here on the ground who could do nothing but watch. The Outside has become silent, no birdsong, no birds in sight - rain must truly be close. The greens of grasses & trees & vines is almost overwhelming under the gray skies; A.C.'s back yard looks like ankle-deep velvet as it winds its way across my sight, bumping into Mary's front yard, her green house almost disappearing behind ginkgo & catawba leaves. But here comes the sun as I type those thoughts, shadows appear on our front lawn, and then leave as clouds cover the brightness, but back again immediately, hinting of a breeze in the sky, and yes, there it is, a bit of movement across the tall grasses next to the creek. August. Wonderland. The noise begins. Cicadas quite loud. A few birds. The humidity moves in through the open doors, Dan from up on the corner walks by. There are even mushrooms in the yard. thank you, debi...for a few minutes of dreaming time. love the rabbit image too. Just don't eat the mushrooms unless you know what you're doing, even if one side makes you larger and one side makes you small. You sure have a LOT of critters where you live! Now, is that a leftover Easter Bunny? They're coming out with a new movie of Alice and Wonderland with Johnny Depp! Can't wait to see it! And the bunny image is great. Daybreak awakening, the height of invigoration: I wish I were not so lazy. simply love the pic...the contrast between the green and white really brings out the whole atmosphere - so refreshing, pure and innocent. love your post too...i guess all of us have a little of Alice in inside us...traces of childhood that from time to time resurface and allow us to enjoy those Wonderland moments once again. Isn't the bunny SO cute! I love the light you are shining. Sheer poetry. and all the stuff that surrounds me? i don't know them either. i will carry the velvet lawn into the day with me.